What Is I Ching Hexagram 14 All About? 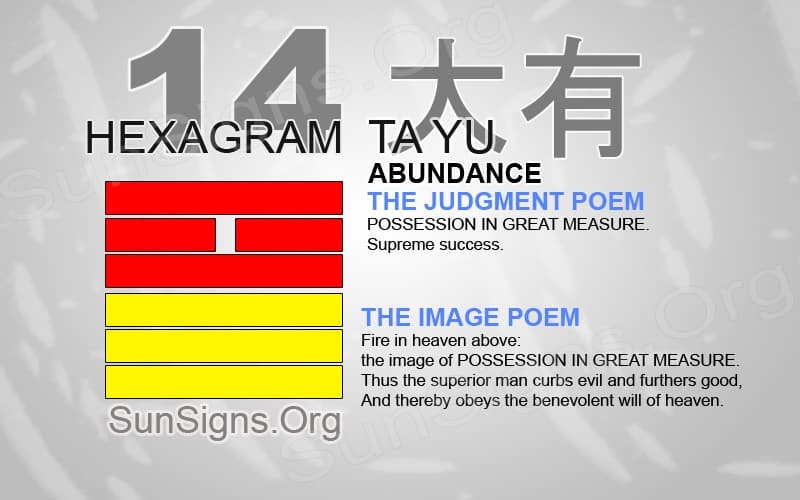 Hexagram 14 symbolizes a period where the caster will have great abundance without any obstacles currently in place. This abundance can be many things from work success to wealth. Thus, no matter what type of great possessions, Hexagram 14 reminds the caster not to be greedy or be complacent in the current phase of life. Sometimes the period of abundance is concise or, this phase doesn’t often happen in life. Others times, this phase lasts for a long time without any end in sight. No matter the case, a person appreciates this abundance. This can determine the length and outcome of this time in life. The greatest part of this period is that there will be few or no obstacles currently in place. This does not limit the progress of success. Although, you have to be careful about the attitudes emanating from a person with great possessions. Or else, this can then lead to actions of greed. Whatever the cause of this great abundance, what a person does with these possessions is important. It can cause either an expansion of success or great disaster. There is a great responsibility that comes from having wealth. Maintaining that possession wisely is the key to preserving any form of it. How one uses that wealth will also play a factor in a person’s success. A foolish person will spend all that he or she has. Also, they do so in a small amount of time on things that have very little meaning. A greedy person will keep all the wealth to themselves. They will work hard to continue to gain more, even at the expense of others. The wise person will learn how to save parts of the wealth. Also, they will use the other parts to affect the lives of others. Most people live their lives without having any wealth or great possessions. Those who do have wealth have the responsibility of helping those who have very little. This goes beyond giving money to the poor but utilizing your possessions to uplift the lives of others. Many organizations work hard to help those who are less fortunate. Donating time and effort when they are in abundance can make a difference in a person’s life. This applies, to both the person doing the work and the person receiving the service. Wealth and possessions come in many different types. These words don’t relate to simply wealth and world objects. But, having abundance in food or time are things that can make the largest difference in a person’s life. These are items that you share more readily. Often, you take them for granted in relationships with loved ones. It is hard to realize the importance of time till we have no more left. We don’t need to be rich to feed others and to share what we have with those we love. You will have many opportunities for success in career and business. Don’t allow greed and pride to take over during a time of abundance. All periods in life are temporary, and even great abundance will come to an end. There are ways to preserve this period. But eventually, the tables will turn. And, the caster becomes the less fortunate and those he or she helped can succeed. Be open to sharing personal abundance. It then allows you to be able to receive someone else’s plenty in the future. We can take what we have and use it to prepare for times of hardship. It does not matter the path you take when in a period of abundance. But, Hexagram 14 reminds us to be responsible and wise with the possessions we have.